annual footfall of over 204 million people. With a firm foothold of both traditional and digital advertising opportunities in the North West of England, our extensive network also includes premium shopping environments and core transport hubs across the whole of the UK. 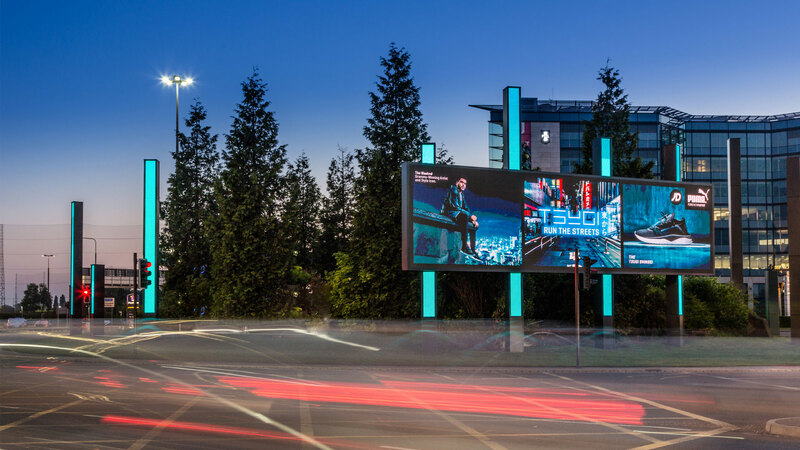 As the only media owner who also owns and operates the entire environment rather than simply the media space, our portfolio also includes the option to create bespoke, interactive installations and community-specific activations. This comprehensive insight and expertise allows you to create meaningful connections with audiences on-the-move and deliver maximum effectiveness. Our unique proposition and deep understanding of the space allows us to provide excellence in service and delivery for our clients by developing tailored and targeted advertising solutions both within our environments, and in the surrounding land to extend reach along the consumer journey and maximise ROI. Perfect Fit Media is a Peel Group investment. To find out more about the other companies within the group, please click on one of the links below. What makes the Perfect Fit? By combining in-depth audience data with a focus on contextual creative messaging, we can ensure that the right people interact with your brand at the right time. By tailoring the content to the specific environment in which it is situated alongside in-depth demographic information, we can reach audiences in the right mind-set to absorb the brand message. Our overall aim is to view each opportunity through the eyes of a consumer in order to best suit their needs and therefore, the needs of our clients and partners.